So you’ve finally finished the laundry, the sorting, the folding, the putting clothes away, and now all you have left to do is iron a few shirts and you’re done. You run the iron over a nice shirt and you see a dirty smudge appear! Of all the things we clean in our house, the iron is often overlooked until it’s already causing trouble. Take a moment and protect your laundry with these simple tips on how to clean an iron. Before cleaning your iron make sure that it is off, and cool to the touch. Next wipe down the iron with a clean cloth and either glass cleaner or white vinegar. Then take a cotton swab dipped in glass cleaner or white vinegar, and gently clean each of the little holes. When you’re done wipe down the whole iron with a clean cloth and water. To clean the inside of the iron, fill the water reservoir with a mixture of half water and half white vinegar. Now turn on the iron, and once it’s hot allow it to steam for a few moments. Spray the mixture through the iron a few times, and then turn off the iron and allow it to cool. Once the iron has cooled repeat the process using only water. 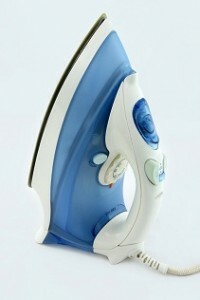 This easy way to clean your iron takes almost no time to do and will keep your iron, and your clothes, sparkling clean!